Stone tablet 1/3 is in room 10. First grab Nightingale's key, then look on top of the armoire. tablet 3/3 is in the attic-room above room 15 (rope up chimney). Last edited by Urumo; 25th Dec 2018 at 07:44. Thank you very very much for this outstanding mission-pack. It is so nice to play, from A-Z, and I am definitely going to replay both missions, not only because I'm short of loot in both parts. Are you Maybe planning to give out a lootlist? And: how many secrets are in mission 2? I'm in the proprietor's quarters. I really don't have idea about what should I find here, I looked every room from bottom to left. I found a chess piece on the top of the bed, one readable, some valuable pictures, and nothing else. Thanks for releasing this beautiful fan mission. The architecture and love for detail is beyond amazing, very well done! Gameplay is great so far, but is has some minor bugs here and there. I think they will go after some polishing in future. Right now I almost finished mission 2. Before I finally leave the hotel after nearly four hours of ingame exploration, I want to find the remaining chess pieces and I am still trying to get in room 13. And I didn´t understand how to get the reward of returning Mr. Jim Jim. I need a spoiler, please. Where is her locker for safekeeping located? Here isn´t anythng ticking off after placing Mr. Jim Jim onto the said persons bed. Also there is a statue with a quote from Alexander Blackwell at its base next to the chapel, one floor upwards of the dining hall. There seems to be a door in the background, but I can´t find a switch. Last edited by Thinking Robot; 25th Dec 2018 at 17:06. Also, I feel like stuck. I've been everywhere except room 13 and the winter wing (I wonder which of these two is essential) and can't find anywhere to continue, since I've just learned that the stone tablets that seem like a solution for the first look, are rather an intended astray. 1) Getting in room 13: Have you been in the attic? There might be an open hatch leading down to said room. Thank you very much! Well, that wasn't easy. Also, I have found all four lost city keys, but only two locks. One in the upper library, and one in the pool. The statues on the second floor opposite the garden and in the observatory are similar to the ones that have lost city locks, but I could not find any locks near them. It sounds like you already got into Room 13, is that right? For Mr. Jim Jim, there is a piece of cheese in the footlocker there. That is meant to be your reward. There was meant to be a bit more that happens when you put him on the bed, but unfortunately we ran out of time before we could get that part to work properly. However, there is another way to dispose of him, that is hinted at by some of staff texts. For the statue with the quote from Alexander Blackwell that is the way into the sealed wing. I assumed you had already been there, but apparently not. Once you have all the items from the secret rooms, that doorway will open. The statue in the observatory has a lock on the back of it. The other statue you need is in the chapel which is on the second floor next to the large dining room. Thanks, I finally found everything and finished the hunting for the remaining chess pieces! I found a lot of secrets, but may have missed something - I finished with 600 short in loot. My save file tells me I needed roughly 5 hours (!) for hunting through the second mission. But it was totally worth it! Overall difficulty was hard to very hard. Mission 1 was a nice intro mission. 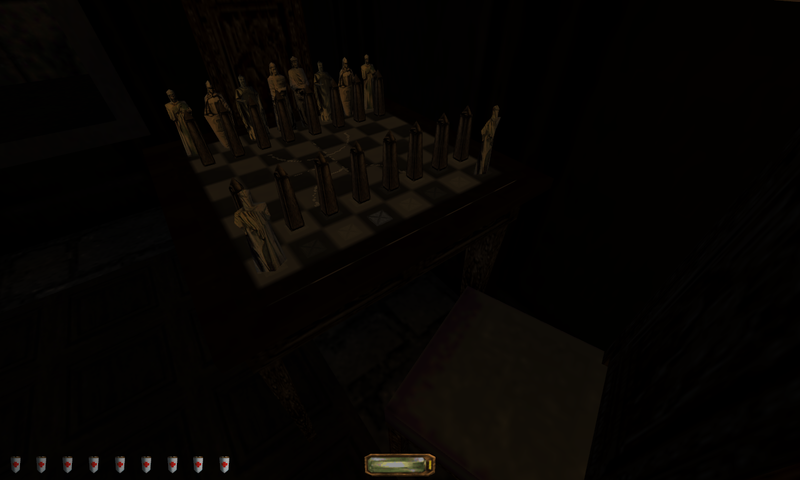 Difficulty was high because of the riddles, loot placement and the genius but also insane placement of the chess pieces. I nearly got stuck in the beginning. After playing I recommend being creative in this mission. Be patient while solving the countless riddles. The second mission also had some nasty horror elements. I liked the strawmen, ghosts and the other scripted sequences like the ball in the pool very much! I wish I had a map or at least a notes page. It could have saved some time for me. And in the first mission there were some scrolls and books being frobable, but did nothing. Sadly time ran out for the developers, so this may be OK here. Overall, I give this mission a 10/10 rating with 9/10 in gameplay due to minor flaws. Second level - I am stuck at the fountain. I put the piece of clothing and the necklace in the middle level of the fountain . When i put the rosary and the journal in the upper level of the fountain ,they vanish in the water and nothing happens !! I need a specific hint , please . Just finished both missions on expert. Thank you guys for the help, sometimes it was challenging to figure out how to go on. not too annoying undead and no unbearable enemies in the Winter Wing. When I first prepared to go there, I excepted tons of undead, maybe invulnerable/invisible ones, which would have been annoying, but no - the dummies and the red lady were fairly enough and nice. I will definitely replay because of the chess pieces. I only found three of them and they must be well hidden since I don't have idea about where they could be. Last edited by ticky; 26th Dec 2018 at 06:44. Started this one ... what a nice village but I have serious performance problems obviously caused by the fog which seems to push the framerate high. There are some white surfaces in the mission, too, probably hanging plants or so. Tried to deactivate fog and weather but alas that didn't have any effect. Being in the village and avoiding the look in the fog's direction helps. I'm afraid that I made a big mistake just at the beginning: Found that strange sack in the bridge guard's chest and threw it right over the bridge in the canyon because I didn't know that it could be important (thought of useless mechanical gears). Now it seems that I had to put it in my hotel room later on and that I have to restart the mission ... how could I know that Garrett doesn't carry his baggage right at the beginning? EDIT: OK, that sack of gear was in my inventory and showed up in the moment I opened the bridge guard's chest so I thought it was in there. Last edited by zappen; 26th Dec 2018 at 14:05. Do not drop any items in the middle level of the fountain. They must all be dropped in the top level. @Zappen: Glad you figured it out. Urumo, Thinking Robot and ticky: Thank you very much for your comments! We are very pleased that you enjoyed the mission. The critiques are welcome and fair, and are all things we were aware of. They will be addressed in an update after the contest ends. Yes, we will release a loot list, and there are 5 secrets in Mission 2, but only four of them give you an onscreen message. @Thinking Robot: Did you manage to find all the chess pieces? We are eager to hear what you thought of that quest. First of all I hope I didn't cause confusion. Yes, I entered the winter wing by the said statue next to the dining hall. But after wandering more than 5 hours through the hotel I simply forgot it. Finding the chess pieces was a real challenge. I found them all. At first I never thought I would find so many, but luckily only two were missing. There were all extremely well hidden, many on chandeliers. So you rewarded the player for exploration and this was great! The hardest piece was the one in the crypt which needed to "water the flowers of eternity. The hint was clever! I liked the reward very much. A great hommage to a well known place in Thief 1! In resume I would like to motivate the other players to search all 16 of them, even if it may take some time. What do those 3 stone tablets do? i placed them on the fountain in the courtyard,but nothing seem to happen. and i need 8 more chess pieces,they are very hard to find,can someone post a list of there locations? @ Azaran Which pieces are you missing?